CresPro is Crescendo's most popular donor illustration software. Because CresPro is cloud-based, you will have access to the software and your information at any location. 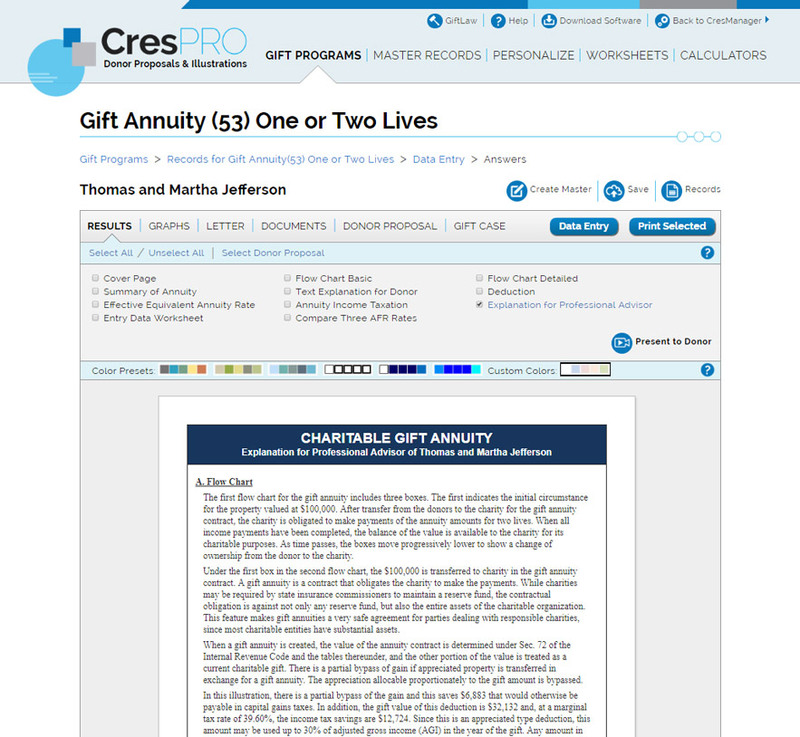 CresPro includes everything needed to close major and blended gifts. 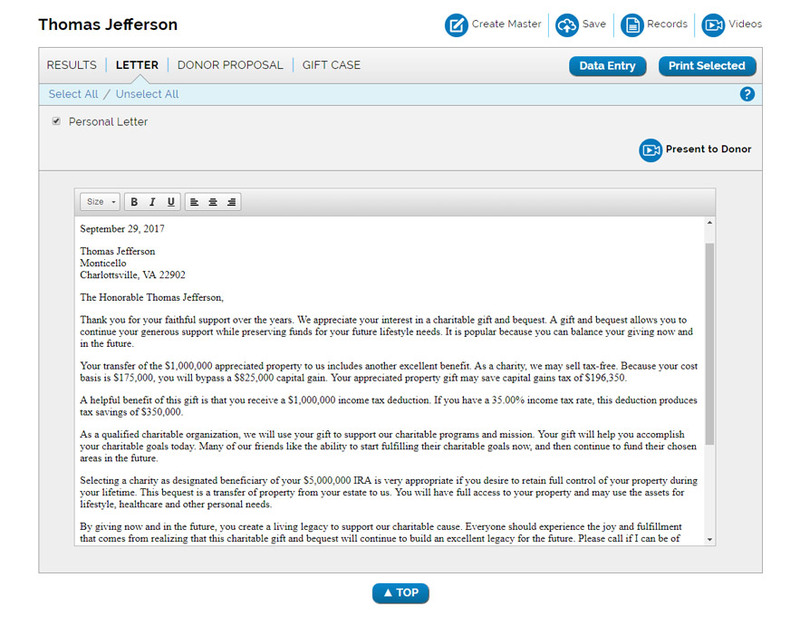 It produces persuasive donor-friendly proposals with personalized illustrations, detailed technical explanations for advisors, trust and annuity documents. When used with GiftLegacy Pro, the most popular major and planned gifts marketing service on the market, you will be able to create and print "magazine-quality," full color, four-page spread donor proposals. 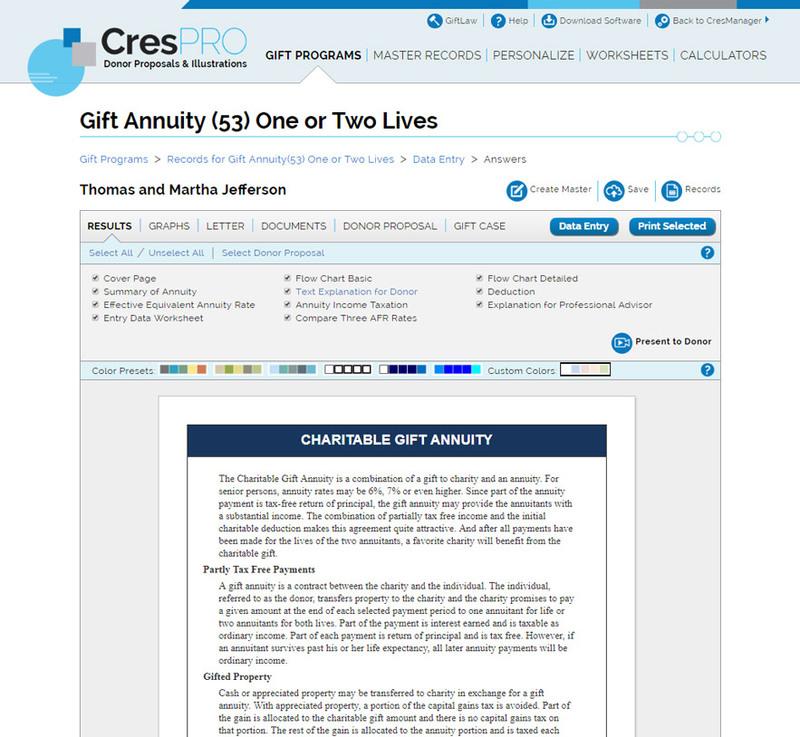 The powerful combination of CresPro and GiftLegacy Pro allows the use of custom fonts, text, photos, colors and logos to generate donor proposals that are unparalleled in terms of customization. 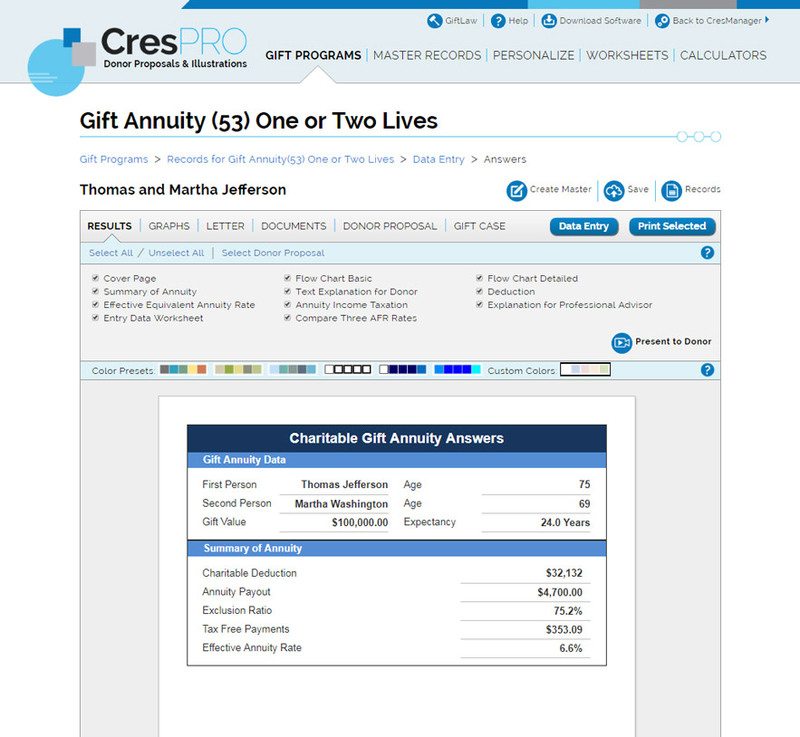 Please visit our donor proposal software comparison page for the list of gift plans available in CresPro and our other software. Custom Print Options - From illustrations to personalized letters, CresPro features more than 20 different print options. Detailed Explanations - From the simple to the complex — whatever best helps donors understand their gift plan — our in-depth explanations provide the right answers donors and advisors need. 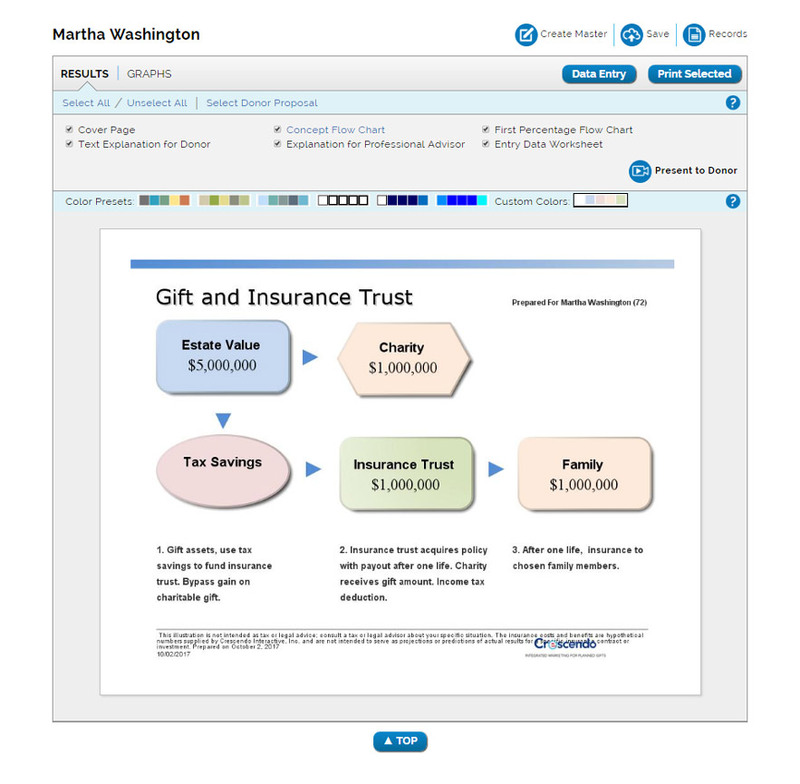 GiftLaw Pro - Available online, our charitable tax reference service features thousands of pages of information on gift and estate planning strategies. It includes links to relevant Internal Revenue code sections, regulations, rulings, cases and more. Attorney Support - Crescendo's attorneys are available to support the software and answer questions during our normal business hours (7:00 am to 5:00 pm PST). GiftCollege - A comprehensive online planned giving education program with more than 100 videos and supporting materials. Calculator - A handy tool that quickly determines life expectancies, gift annuity rates, income and estate taxes, present values and more. Help System - The software includes a complete "Help" directory and video tutorials on key topics. "We are excited about the new CresPro software! 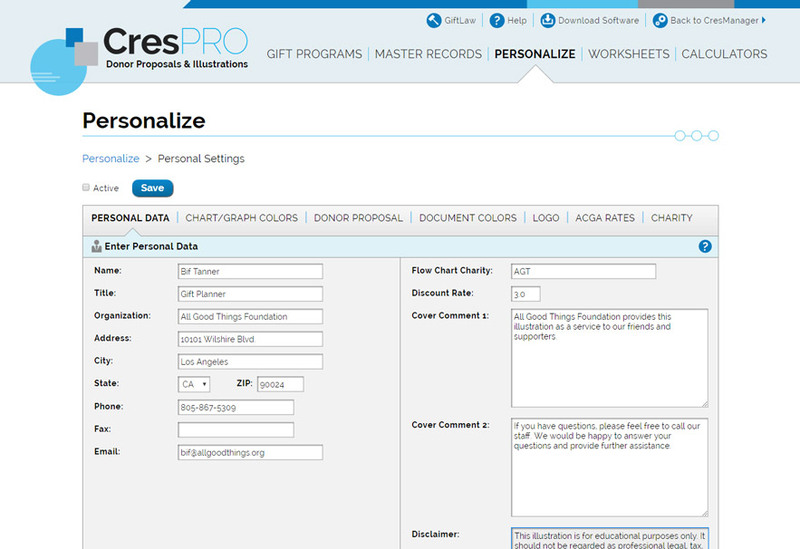 The new proposals bring funding opportunities to life with the ability to personalize them for each donor while fully integrating our branding and custom text. 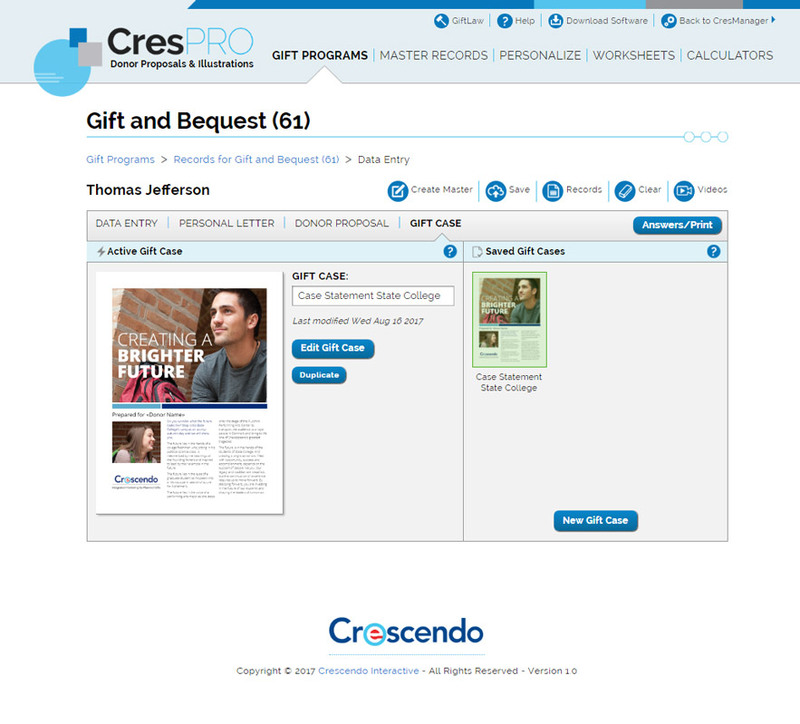 We've always relied on Crescendo for our donor proposal software and we've had great success with it. 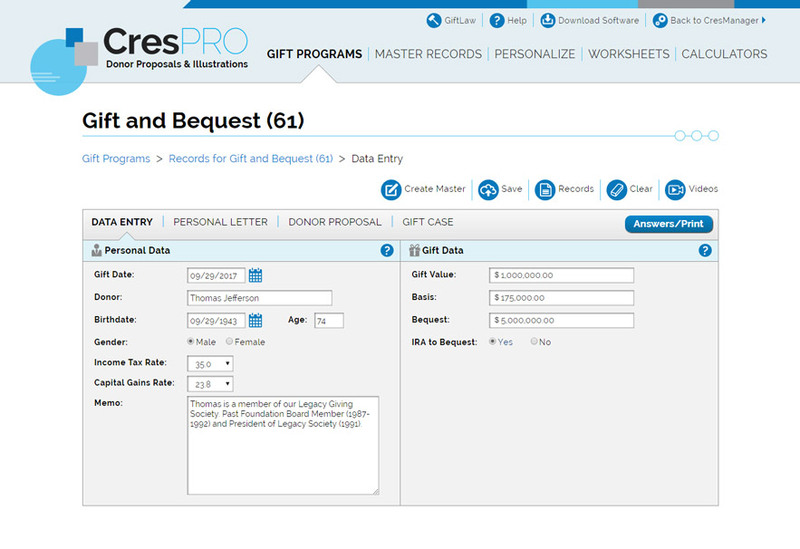 We look forward to enhancing and increasing asks and closing more gifts than ever with the power of the new donor proposal software, CresPro"
For a free demonstration of CresPro, please complete our trial request form or call us at 1-800-858-9154. 1. What are the key features of CresPro? 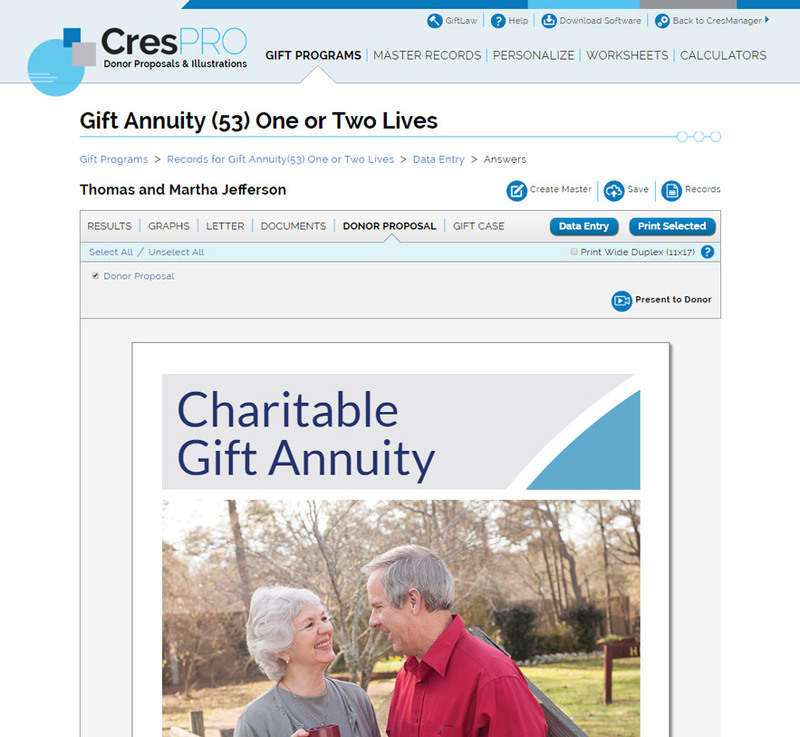 CresPro produces easy to understand illustrations that communicate gift concepts to donors. Our personalized presentations are both powerful and persuasive. 2. What are CresPro's requirements? 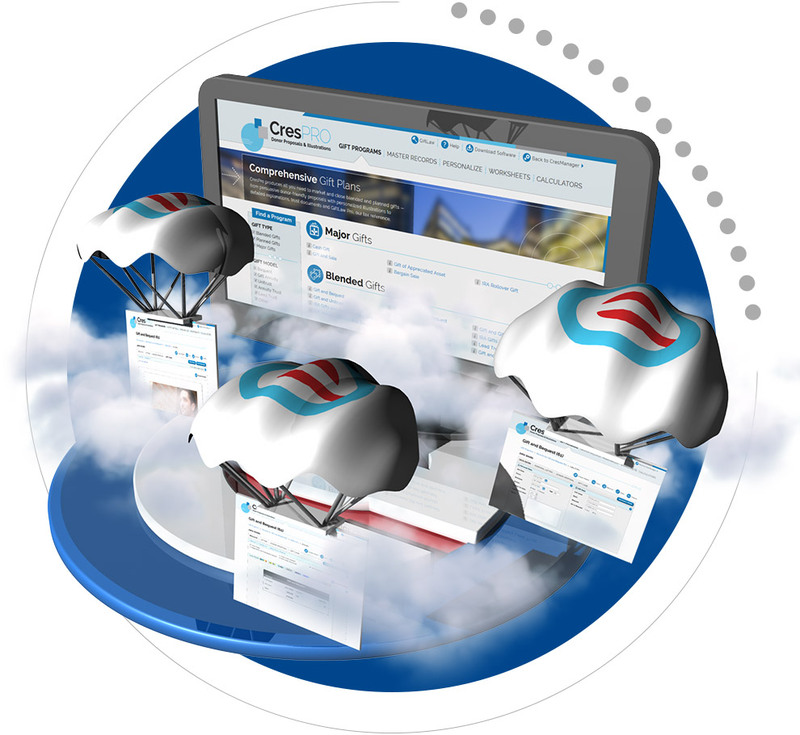 CresPro is cloud-based software. It can be used on PCs, Macs and iPads, and is accessible by and compatible with the most popular web browsers. 3. What is included in the purchase of CresPro? A single user, annual software license, and a detailed electronic user's manual and planned giving support services. 4. What kinds of organizations use CresPro? Colleges, universities, healthcare organizations, social service organizations, religious organizations, financial professionals, CPAs, attorneys, CLUs, banks and more. 5. Is a demonstration of the software available? Yes. Please call us at 1-800-858-915 for a FREE trial. 6. What kind of training is offered? 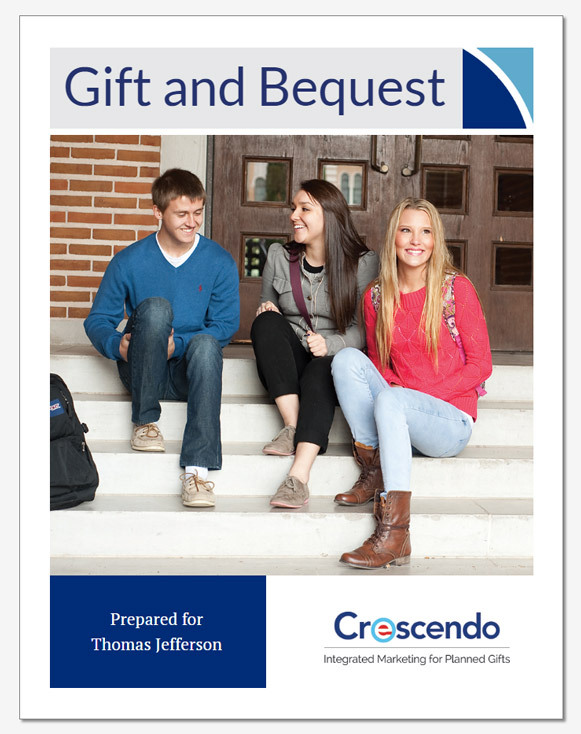 Crescendo offers seminars which include both hands-on computer and planned giving training. Our two-day Comprehensive Seminar teaches the basic programs of Crescendo and features both computer training and gift planning concepts essential to making proposals and presentations to donors. Our two-day Advanced Seminar is for experienced users and highlights the more complex programs including options for funding education and retirement, the lead trust, charitable estate planning models, family corporations, unitrust insurance replacement and testamentary unitrusts funded with IRAs. 7. What is the cost of training? Please visit our training section for a complete description of our training services and cost. 8. Where are trainings held? Most seminars are taught at the Crescendo computer classroom in Camarillo, California. In addition, Crescendo provides computer and planned giving training in major cities each year. Please check our our training schedule. 9. What technical support is offered? Crescendo is known across the country for its uncompromising service and expertise. No other company provides so much in-house planned giving education and support. Charles Schultz, J.D., our President, has extensive background in planned giving and his team of tax law experts are available to give users the support and charitable expertise needed to create proposals and close planned gifts. 10. What is included with support? Crescendo's service contract includes unlimited telephone support, tax updates, weekly emails, quarterly Crescendo Notes enewsletter, "Rate of the Month" letters and annual program enhancements. 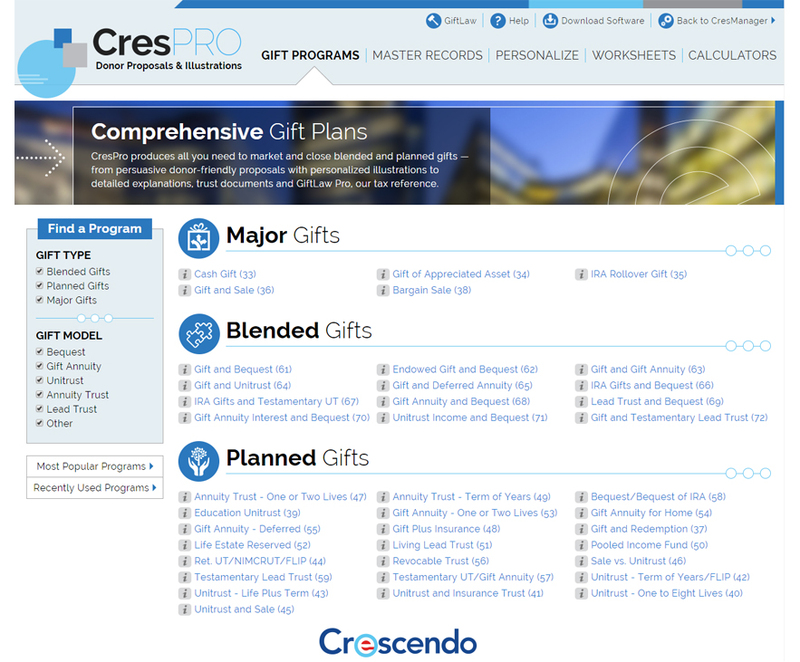 Crescendo also offers educational seminars featuring both hands-on computer and planned giving training.